This article is specific to Business Email. If you have a different type of email, please see Workspace email Thunderbird instructions. You can set up your new Business Email account in the email client Mozilla Thunderbird. Click on Local Folders in the left side-bar. Select Email to create a new account. Your name This is the name that you want to display to others, when they receive your emails. Email address Your full Business Email address. 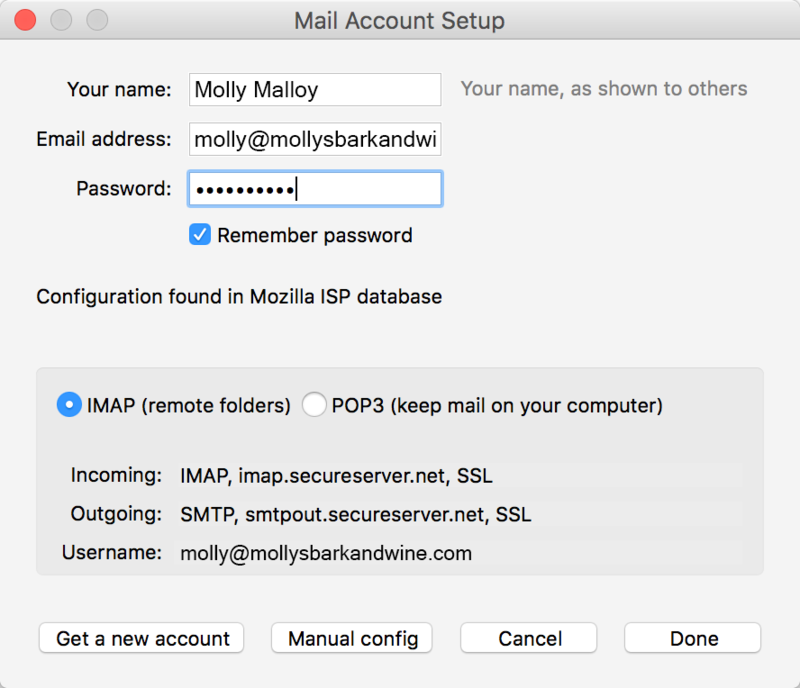 If you see the message Configuration found in Mozilla ISP database your email is ready to set up automatically. Be sure the Incoming, and Outgoing settings match the correct server addresses for your region. If you see the message Thunderbird failed to find the settings for your email account, you'll have to enter your server addresses, manually. Find the correct sever address for your region, here. Server hostname Enter the correct incoming and outgoing server addresses, you found above. Port Select Auto, for both incoming and outgoing. If you prefer, you can select a specific port, and SSL setting. SSL Select Autodetect, for both incoming and outgoing. If you prefer, you can select a specific port, and SSL setting. Username Enter your full Business Email address, for both incoming and outgoing. You should see the message The following settings were found by probing the given server. Click Done. Note: As a courtesy, we provide information about how to use certain third-party products, but we do not endorse or directly support third-party products and we are not responsible for the functions or reliability of such products. Thunderbird is a trademark of the Mozilla Foundation in the United States and/or other countries. All rights reserved.